USA Today has just published what might be the most irresponsible piece of financial journalism I've seen in the past five years of writing Get Rich Slowly. It embodies everything that's wrong with the popular perception of stock-market investing. Stock investors looking for a trading pattern that all but guarantees a profit need look no further than the first trading day of a new month. Everyone knows stocks trade in recurring seasonal patterns, with the best gains coming in the three-month period from November thru January. Then there's the annual Santa Claus rally at year-end. Not to mention the January Effect, where small-fry stocks post fatter returns than big-company stocks in the first month of the new year. But one of the biggest winning trades in 2010 has been Day 1 of a new month. There's the notion that investing is all about timing the market, about finding “hot” times to get in and out. The second paragraph includes not only the “everyone knows” bit (I would never allow a staff writer or guest author to say “everyone knows” about anything on this blog, especially for something like this), but also the list of patterns, the last two of which are actually contained in the first! How does one buy on the last day of the month and sell on the first without losing a small fortune in trading fees? And what exactly do you buy? An index fund? Specific stocks? Not to mention the author used the word “thru”…and the editor let it thru. The sort of “investing” promoted in this article isn't investing at all — it's gambling. I know plenty of people (including me!) who have lost money trying to find silly “get rich quick” shortcuts like this. Tangent: Plus I made the mistake of reading the comments on this article. Want to know why comments on Get Rich Slowly are moderated? Look no further than the discussions at USA Today, where the worst in public discourse is on constant display. Because any fool with a spreadsheet can go hunting for meaningless patterns in stock market data, I decided to be that fool. I downloaded all of the data for 2010, and I ran my own analysis. Guess what? The first trading day of the month isn't the only day that boasts just two losses in 2010. The 8th trading day of the month has nine gains out of eleven! That must mean something! (And working backward, the 15th-to-last trading day of each month also has nine gains out of eleven.) But would you ever make it a rule to invest on the 8th trading day (or 15th-to-last trading day) of the month? Of course not. If you want to avoid losses, though, you'd better watch out for the 10th and the 16th trading days of each month. They've only posted gains three out of eleven times in 2010. (Both the last and 2nd-to-last trading days of the month do as poorly.) But again, would you actually use this info for investing purposes? I doubt it. In reality, anyone with enough time can go searching for patterns in past stock-market data. Lots of people have done so. But nobody I know has ever found a pattern that works going forward — except for buying the entire market and waiting a few decades. But this isn't an investment strategy. It's gambling, pure and simple, and for USA Today to run this article as anything other than entertainment is irresponsible. There are 65 reader responses to "Stupid Stock Market Tricks". Though I know nobody cares, I just wanted to point out that I had a blast writing this post. It was the first time in a long time that something got me so fired up that I stopped everything else to write something. This is what it used to be like, and I wish it happened more often. I’m still shaking my head that USA Today published this. And “thru”? What’s up with that? The only part of this post I have to disagree with is the recommendation for the Pi soundtrack while programming. It’s too distracting. Personally I prefer the Conan the Barbarian soundtrack. OCTOBER: This is one of the peculiarly dangerous months to speculate in stocks in. The other are July, January, September, April, November, May, March, June, December, August, and February. You are right, JD, this is terrible advice and it is easy to write articles in hind-sight. I thought the other day being it was “cyber Monday” that Amazon and other tech stocks would get a boost from speculators. However, the debt crisis in Ireland and North Korea overshadowed my hopes of any real gains. What it takes is experience and tracking to really assess the periods of under valuation and over valuation. Yet, even saying that I thought NFLX peaked at $100 a share not too long ago and it is still exploding. I can relate with you completely! I traded a few stocks myself based on Technical Analysis. Luckily, I didn’t lost my shirt in the process. Investing should be for the long term and should be diversified. Your hard earned money is too precious to gamble away in the market. So how are you going to find more stuff to get (legitimately) fired up about? @JD: especially since you enjoyed it, and also because I think it’s important to keep “respected” media outlets honest, how about a recurring series or section/tag/category of posts that deals with exposing bad advice and countering pop culture myths about money and personal finance? It reminds me of Bruce Schneier’s “Dog House” blog posts he used to do about security companies selling snake oil. The funny thing is, there actually are odd persistent patterns in the stock market like this. But the actual effect is so small that it’s washed out by trading costs. So these patterns are real, but unexploitable. Which really ought to be common sense–if such a simple pattern were exploitable, it would be immediately arbitraged away by hedge funds and endowments. I have found technical analysis and mechanical investing to be very successful. I know a good number of people don’t believe in it, and that’s fine, although I’m one to believe that if a certain set of conditions exist then a certain result is more likely, so over time a good model can work well. Although I wouldn’t put much trust into a USA Today write-up just because of the source, I was surprised at the negativity in the blog post. Mostly because of the ridicule that was being lobbed without a working knowledge of the subject. Throwing insults from ignorance is an instant lack of respect in my book. If Kris were home (she’s in Chicago), she’d get on my case. First, I put up a second post today. She thinks there should never be more than one post a day at GRS. More than that, I mocked the author’s use of the word “thru”. (Which is a word, but it’s very informal, and should only be used for advertising, etc.) This is hypocrisy on my part. I’m notorious for typing “through” when I mean “threw”, and Kris always lets me know about it when I mess that up. There are probably dozens of examples of this mistake in the GRS archives that have never been corrected. Okay, I need to quit dinking around and get some actual work done. I’ve spent two hours de-railed by this, and that means Friday’s post is behind schedule! That’s it! I’m thru with USA Today! I love your blog! Been following it for a bit now. I agree that articles like these in USA Today and other outlets are part of the reason why so few people understand what investing is actually about. For that reason mostly, I don’t read most popular business magazines (Forbes, Businessweek, et al.) simply because their opinions change so frequently. In fact, Businessweek can often be used as a contra-indicator for things like bubbles and panics, because they are almost always late to the game :) Related to this article specifically, though, it is possible to find so many different conclusions when you look at historical data, which is why anyone can state, with evidence, why their theory is correct. Have you ever read Bad Money Advice? 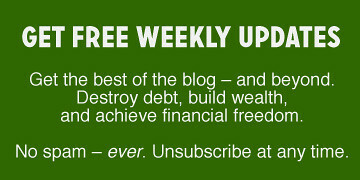 It’s a whole blog dedicated to pointing out brain-dead financial advice like that article. Yeah, that’s pretty crappy advice. Might as well go to Vegas and have some fun. LOL JD, you were definitely fired up, and it’s great! Honestly, those types of articles get me so ticked off. Yahoo Finance can feature some fairly inane articles by PF writers as well. For instance, it irks me to no end to see Kyosaki pushing his expert stock/trading seminars and courses, which will cost you mere thousands up front, as did his RE investing courses that he pushed even as the housing market crashed. UGH! JD, I’m sorry, you are wrong and irrisponsible for writing your article. There’s a guy who’s a friend of my wife’s uncle who says he is making a killing buying on the 3rd day of the month, and selling on the 22nd day of the following month, except on a leap years when he waits till it’s a full moon, then he goes short, but if his charts say its a Grand Supercycle, then he uses leaps in a covered call to protect his downside. It’s guaranteed! The USA Today author should take a Random Walk off the end of long a pier! April Fool’s Day is on the first day of the month . . . Coincidence? How sad is it that a huge chunk of the general population – and idiots who write for major media outlets – have not learnt the most basic financial fact. If it looks too good to be true it, it is! I guess people will always look for a “get rich quick” scheme, but it’s so painful that people believe it. Also, props to JD for maintaining high writing and editing standards! Awesome post! Any finance editor that allows a post like that to get “thru” should be taken behind the woodshed. Personally I don’t think people who read USA Today are doing it for investing advice. I’m an “active” investor and I read a lot of news pieces daily if possible. I usually read USA Today. An article like this would be more of a novelty. Something interesting to read, cause, as someone else pointed out, there are a lot of patterns in the stock market. But this would be pretty useless info. Most of the stocks I am watching had gains of 0.5% – 3%, with almost all of the 50 or so stocks I watch posting a gain. But if I traded based on 3% gains I’d never make any money – fees and taxes (not to mention what I’d have to pay my CPA to sort all this out during tax season) would eat up most profits. I think this article is more of a novelty than anything serious…at least I hope that is the case. This post is a perfect example of why GRS is my favorite blog. As an editing nerd, I loved this post. Especially the “thru” point. And the Mark Twain quote @3 made me laugh out loud. Good post and I agree that this is terrible advice. But this is the type of article that generates discussion, witness I am the 25th comment on your post. In a prior life I was a division controller for a group of 15 small newspapers. I would have loved to seen an article like this in any one of them to drive interest and ad revenues. USA Today has some decent articles but I am convinced that newspapers and the financial news media in general are more about driving revenue than providing good information. Mechanical investing is a completely valid way to invest in the market. It frees you from emotional investing, provides solid rules for both entry and exit from the market, and has proven returns. More than can be said for “buy and hold” investing. I don’t think this is any worse than any other financial advice in the mainstream media. None of it is trustworthy. That does not mean it is always wrong, it just means there is a lot of ban information out there and separating the wheat from the chafe is impossible. The reality is that anyone who is “actively investing” is gambling. Unless you are going to have a role in the management and direction of the company you have no real control over how well your investments will do compared to others. Even buy and hold is basically speculation. The only difference is that you have history on your side. And this, JD, is why I love you. To be fair, you will not lose “a small fortune” by buying stock on the last day of the month and selling on the first day of the month. Transaction fees are about $10 on both ends. But it’s still a terrible way to invest. Crap. Today is the 1st day of the month, but I didn’t read this until after the markets closed. Even worse, this is the last month of the year, and the author specifically pointed out that this is (was) a hot trend of 2010. What if there’s a different pattern in 2011? Have I missed the boat? if everyone knows, and everyone does buy on the first day of the month, then I know have a ton of buyers for those companies I bought on the 26th AND… when the 5th of the month comes out, and EVERYONE is trying to realize the paper profit they made, the market value plummets, my options can be exercised, and I double end the deal. How can this be a bad thing for smart inv.. er, speculators to profit from? Simple Simple Simple. Buy low, sell high. Take advantage of anomalies in the difference between true value and market value. I love the advice. I hope more people mindless “invest” this way. Spend some time with the FT; Read Margin of Safety; Do your research; Buy a dartboard; Select carefully; Don’t gamble what you can’t afford to lose. I just cannot believe that they allowed “thru”! I’m totally with you on that article. Where does February 29th fit into this cycle? This statistical calendar correlation is as useful as the correlation between returns of the stock market and moon phases. (Stocks perform better in the week before and after a new moon but this could be a spurious relationship, of course.) However, this type of analysis does matter to traders. We could argue whether you want to call traders “gamblers” or not but traders do play a vital role in the functioning of markets. In any case, you can get lots of such statistics in the Stock Trader’s Almanac which has the word “Trader” in it for a very good reason. I do agree that, typically, the majority of financial journalism is a joke. However, I also believe that one should have an open mind about everything, especially something as critical to your long term well-being as investing your money. The fact is (and yes it is a fact) that historically (read: not just 2010) the stock market has exhibited superior performance on the first day of the month. There are several logical, non-hocus pocus reasons for this trend (month-end portfolio adjustments by institutions, investment of monthly stock purchase plan proceeds by mutual funds, and month-end salary draws by members of the investing public which route them into various investments). Are the returns guaranteed? Of course not, but there is a difference between gambling when the odds aren’t in your favor, and gambling when they are. Casinos make money because the odds are in favor of the house. However, in the case of the “First Day Effect”, there has historically been a greater than 50% chance of the market being up. Also, the gains have been larger than the losses. Mathematically, placing small bets (to be consistent with your gambling analogy) will pay off in the long run. Am I recommending putting everything you have into this strategy? Of course not! But using 5-10% of your account to buy a leveraged 2X ETF like QID or SSO the last day of the month and then selling it before the close on the first day will not make you go broke. The ETF will not drop to $0.00 in one day, and even if it does, the most you would lose is 5-10% something you buy and holders should be used to by now. I do respect JD and this site (I’m a daily reader), but I do differ in opinion on topics like this. You may think “tricks” like this are crazy, but I think holding investments when they go down is crazy. AC, not to pick on you, but whenever I see people write stuff like this, I always wonder: Did you think active traders forgot about “Cyber Monday?” Do you think they were somehow caught off guard? Did you think that on Friday, they’d be selling their Amazon stocks for $170, and then Monday morning they’d wake up and be like, “Oh crap, it’s Cyber Monday, isn’t it! I’d forgotten all about it!” then suddenly the stock would jump to $180? Did you think everyone else following Amazon stock wasn’t already expecting a sales boost on Cyber Monday? The ONLY reason you could reasonably expect a boost in Amazon’s stock price would be if you somehow had a hunch (or insider information?) that Amazon’s sales numbers would be even higher than they had already predicted. And why in the world would YOU – some random guy on the Internet – believe that you would have a better idea of Amazon’s expected sales than professional Wall Streeters, or even Amazon insiders themselves? The truth is, any expected boost from “Cyber Monday” was already built into Amazon’s stock price on Friday. It was built in months ago. Burton Malkiel was right. The market is efficient. I hate it when people make financial generalizations that have no real factual basis. Beyond that – love that you nitpicked on “thru” – only acceptable in texting if you ask me. To be honest though – the Pi reference is my favorite thing about this post! Love that movie! Even if there were such a trend, and even if it held into the future, an efficient market would eventually level it out as soon as it became public knowledge. If everyone knew that stocks were going to rise slightly in value on the 1st of the month, then there’d be a surge in buying on the 31st, as everyone bought in to take advantage of the spike, right? And what happens when demand increases on a fixed supply? The price goes up. So the price would go up on the 31st. Because by the time the 1st comes along, everyone has already bought in, expecting their big gain. Now that everyone knows that the price is ACTUALLY going to spike on the 31st (as everyone moves to make sure they’re in the market for the big gain on the 1st), people would start buying earlier. Say, the 29th. Which moves the price spike back even further. And further and further, until there’s no spike at all, and any additional trading gets lost in the regular market noise. The bottom line is that stock prices change day to day based on new information. News is random and cannot be predicted, so stock price changes are random and cannot be predicted. And as with anything that is truly random, we can see (sometimes strikingly clear) images in randomness if we look hard enough at what has already occurred (think Rorschach tests). The mistake is to think what we are seeing as real somehow caused the seemingly random events when it’s really the other way around (was the butterfly image actually already contained in the ink before the paper was folded?). The random events caused what is seemingly real. Great article, JD. I’m sure you saw that the Kardashian Kard is already no more (http://kardashiankard.com/ is now a godaddy parked domain). Maybe criticism from this blog helped push that? Meanwhile, you should read the financial newsletter from our company’s financial advisors. I read it and some of it sounds quite reasonable, but at the end I just feel like they took six pages to push lifetime annuities. Totally of topic, we are listening to The Cinnamon Bear every morning and my kids love it — thank you for sharing! Wow — I had never read the comments at a site like USA Today. It really does give me a whole new appreciation for you, JD! I’m not really surprised that USA Today let a word like “thru” into the paper. Agree fully. I wonder whether any of these so called stock strategies and stock experts can ever help but this is particularly useless. But, you know, like maybe this atricle will get ya thru some bad times. Know what I mean. But, you know, like maybe this article’ll get ya thru some bad times. Know what I mean. For sure. I can understand why something like this would get you so worked up and usually I would agree with you. This time, I am not so sure. Hear me out then let me have it in an manner consistent with GRS posting policy. This article is not aimed at everyone, it is aimed at traders that (try) and make money on the short term trends in the market. Is the gambling? Yup. And like gambling most of us fail to have a positive outcome. But, there are some people, like Blackjack card counters and poker pros, that are successful. In these articles you start with a trend which is just statistics. Like the ones you identified. THEN you present hypotheses that show that trend to be reasonable (that is, based on something other than pure random numbers). Finally, the trader asks themselves “Do these reasons support my bet on this trend continuing in the future? What will kill this trend?”. Then they put their money down and see what happens. Is this investing? NO. This is trading and while my hat is off to those who can do it well, the average (or even above-average) GRS reader should never try and use this info with their retirement funds. As to the specific article, there are two items that I think show some support: money becoming available for investing at the first of the month (although I think this one is a little weak) and a key manufacturing report (which is VERY important in THIS market). The article is not bad from an info for traders point of view although the editor should have gone thru it one more time for style. OK, now have at it! I have always wondered if you buy at a slight premium during the first days of the month, as millions of people across the United States have 401(k) plans where stocks are being purchased near simulatenously. As you have always pointed out, little things compounded over years do matter. Answer: I bought 200 shares of BGU (a 3X Market Bull ETF) on 11/30 at $59.21. I just sold them today at $64.33 for a profit of $1004.02 after a comission of $19.98 (0.16%) on both transactions. After tax I still keep $720 for a cool 6% net gain in a couple of days. Don’t get me wrong, I’m a long-time investor, but I do keep some play money to experiment with trading strategies. To dismiss this article is foolish. Every strategy has a place and time. In other words, just because there is a correlation does not infer that it has meaning. You have to do a much more rigorous analysis to determine if there is a causal factor at work – and what is the cause(are large institutional investors buying on Mondays, bringing up the prices? Do people buy the day after they get their paychecks?). Or is it completely coincidental, in which case you cannot say that it’s a trend and should not use it as a basis for an investing paradigm. @49 Suzanne. Absent any causation, one can still trade off of correlations as long as they continue to occur. If the lottery numbers came up the same for 12 weeks in a row, there may be no legitimate reason, but I’m still going to buy a lottery ticket and play those numbers in week 13. Markets are not perfectly efficient, nor are they random in the long term. Trends do occur, and I make money off of them. Index investing is fine for the casual investor who does not know what he or she is doing. However, there are those that can and do make money with alternate strategies. To completely discount them is only doing yourself a disservice. Those who can make money trading do, and those who can’t preach passive, index investing. It is not necessarily a matter of a person’s capability. It is their knowledge of the game (and it is a game, just with very high stakes) and the amount of time they can spend on playing the game (or hobby, if you prefer). A point of contention: In your first statement you say you can trade off the correlations without reasoning. While I agree it is possible, it is not necessarily a good idea. It is a VERY easy way to get burnt. Example #1: The people who are now underwater on their mortgages through no fault of their own. I find the “everybody knows” bit rather amusing…if everybody knows the pattern, shouldn’t it disappear, since everybody’s trying to exploit it? Unless you pull a Mcfly and travel to the future to pick up a Wallstreet Journal any “strategy” you pull from past data is nothing more than bupkis, conjecture and magic! If what you say is true, why invest in stocks at all? I think you’re on to a new strategy and need to trademark it ASAP or I will. Did you see the pattern? The 1st, 8th, and 15th go up. I bet the 22nd does too. Every seven days it’s time to buy stocks! Giddyup! There’s 3 more buying opportunities this month! Of what, I don’t know, but add some stock shopping to your Christmas list! There are so many terrible new reports, print or video, regarding financial data. The toughest thing to accept regarding the stock market is that you are not smarter than everyone else. There is no secret pattern no one else knows about. Occasionally if you are smart and informed, you can find a really good oppurtunity. But that happens only so often, and if you invest regularly you will start inventing oppurtunities that dont really exist. I agree with Andrew 100%. I trade actively and it has been quite lucrative for me. It takes lots of research time, yes, but it is absolutely a viable (and replicable) way to make money. Is it for everybody? Of course not. Neither is being a landlord, or working a high-pressure high-pay job, or running a small business, or any number of other legitimate money-making avenues. Most small businesses fail, does that mean no one should ever start a business because the odds are against them? Index funds are a fine place to put your money if you don’t have the time or inclination to trade. There is nothing wrong with that. But I am a little tired of the trader-bashing that goes on here. I could be mistaken, but this gives me the impression I am not welcome here. That would be sad for me, as I have enjoyed reading GRS for almost as long as it has been around. I know that active trading is currently taboo in the PF world, but I would encourage a bit more open-mindedness from this group, which I think tends to be of above-average intelligence and acumen. @Des, and all you other “Active Traders” out there. I’m going to assume you’re smart. So, you must surely know that for every “winner” in the market, there is a “loser.” That is, when you trade a stock with someone, that stock can only go in two directions: up or down. If you were the buyer and it went up, you won that transaction. If it went down, you lost (and the seller won). It’s a zero-sum game. Those are the only two possible outcomes, agreed? So, you seem to believe that you have a consistent ability to be on the “winning” end of the majority of your trades. That is, you believe you can consistently beat the average. Right? OK, stay with me here. If you are consistently earning above the market average, and the people investing in index funds are guaranteed to earn exactly the average, then who in your universe are the losers? Where are all the losers who are enabling you to consistenly be a winner? It’s a mathematical tautology that “we can’t all be above average.” Thus, if the indexers are guaranteed to be exactly average, and you think you’re above average, then who do you think comprises the equally-large group of below average traders? Is it the institutional investors, with hundreds and hundreds of billions of client dollars at their command, and immediate access to market information, and instantly-executed trades? Is it the pension fund managers, with hundreds and hundreds of billions of dollars, and their professional, experienced investing experts? Just who do you think is on the losing end of all your trades? Do you think it’s even remotely possible that in the long run, you will end up earning below average returns, executing trades in your spare time, with no investing education or experience at all, and your 20-minute-delayed stock quotes, and your “When-we-get-around-to-it” eTrade stock executions? If it is a zero sum game then how does the “average” ever increase? If my winning $1 means you lose $1 then there would be a finite amount of value in the market which would never increase or decrease. That is just not the case. The value goes up over time. That means we can all “win”, so to speak, just some more than others. So, let’s say I bought a stock yesterday for $10, and I sell it today for $12. I “won” $2. Now, let’s further say that tomorrow, it goes up to $15. I didn’t “lose” those $3, I just didn’t “win” as much as I would have if I held on. I won and my buyer won. Does that happen every time? Obviously not. Some people lose lot’s of money. The same can be said of small businesses, many people lose lot’s of money, but we still consider it a viable option. “then who do you think comprises the equally-large group of below average traders? In a word, yes. You certainly know this to be true, that statistically actively traded mutual funds do below average. So, then, who do you think is on the other end of that? If they are, in the long run, below average, who is on the flip side? Institutional investors have lot’s of information and tools, it is true, but they are also wielding huge amounts of capital. They can’t move in and out of a stock without affecting its price. That means they can’t move on their new information very quickly without tipping their hand, and that is a weakness that can be exploited by small investors who know what they’re looking for. Not to mention mutual fund managers are expected to be fully invested (or, nearly so) at all times. If they thought the market was going to go tumbling down they can’t pull out and sit in cash until the storm is over. That means when the market tanks, they go right along. Individual investors don’t have such a restriction. I don’t think someone with no education or experience will consistently beat the market. I think active traders who invest lots time in their education and research have the ability to beat the market. Is is “remotely possible” that I will end up with below-average returns? Yes, of course, in the same way a landlord knows that it is “remotely possible” their new tenant will trash their house, or an entrepreneur knows that his or her business venture may fail. Not everyone will open a business, and not all businesses will survive and thrive, but that doesn’t mean it is not a legitimate way to make money. You are confusing investing with trading. Investing is not a sum-game at all; however, trading (or trying to beat the market) is a zero-sum-game. Practically speaking, it is a negative-sum-game because of the added costs involved in trying. This means that out of everyone truing to beat the market, more money will be lost than gained. The thing about negative-sum-games is the longer you play, the greater the likelihood that you will lose (and the greater the size of the loss). Whether you actively trade or just buy and hold a total stock market index, you will still participate in the growth the traded companies. The zero/negative-sum aspect of trading is relative to simply holding the lowest cost total market index fund (that’s what you’re aiming to beat, right?) You are only better off trading if you can beat the other active traders at their own game. Not only that, but you must beat them by enough to cover your added expenses of trying. This is why it is actually only remotely possible that an active trader can end up with above average returns. It has nothing to do with skill, it is just math. Both Pi and Requiem for a Dream were directed by Darren Aronofsky. Both movies near the top of my list. Experience them both! Well as far as “Buying and holding for a couple of decades”…this strategy ended up yielding me considerably less funds then I put into my Sons College IRA. Buy and hold makes no more sense then all the other “patterns” you discuss here. Although I am well-versed in passive investing with index funds, recently I’ve been mildly interested in active trading. In fact, hedge funds utilize alot of mathematics (obviously not as simple as buying the 1st day of the month..) to exploit patterns in the stock market to make alot of $. And there actually are people out there who make a good living actively trading stocks. But most people fail, so doling out advice other than passive investing is a bad thing in my opinion. I however, have some money to invest. I used a very small amount of money to test a system that I came across a few months ago. It utilizes alot of company fundamentals, so it’s not 100% pure technical. So far it has been doing pretty well (beating the S&P 500). I still have most of my assets in index funds however. @JD #10 I first read that as “I need to quit drinking” and thought “AWESOME!” I was disappointed to re-read it and see it was “dinking around”. Second of all, holy throwback to Pi. That movie was absolutely crazy. Lastly, you need to write more stuff like this. :) It has YOUR voice all over it. It “sounds” human, raw, real. LOVE it.